Skullcap is a name that refers to any of the dozens of species (Scutellaria) of the mint family Lamiaceae. The plant’s name refers to the helmet-shaped calyx on the outer whorl of the plant’s tiny flowers. The flowers range in color from blue to pink. In herbal medicine, the name skullcap refers to Scutellaria lateriflora, a perennial herb native to North America and cultivated in Europe. The leaves, flowers, and stems are used as herbal remedies. Skullcap is also known as scullcap, American skullcap,Western skullcap, European skullcap, blue skullcap, greater skullcap, hoodwort or hoodwart, blue pimpernel, Quaker bonnet, helmet flower, hooded willow herb, side-flowering skullcap, mad-dog weed, and mad weed. Chinese skullcap (Scutellaria baicalensis) is a related species. The species Scutellaria baicalensis Georgi is native to eastern Asia, and the skinless yellow root of this plant is used in traditional Chinese medicine (TCM). Its Chinese name is huang qin. Chinese skullcap is sometimes called baikal, baical skullcap root, scute, and scutellaria. 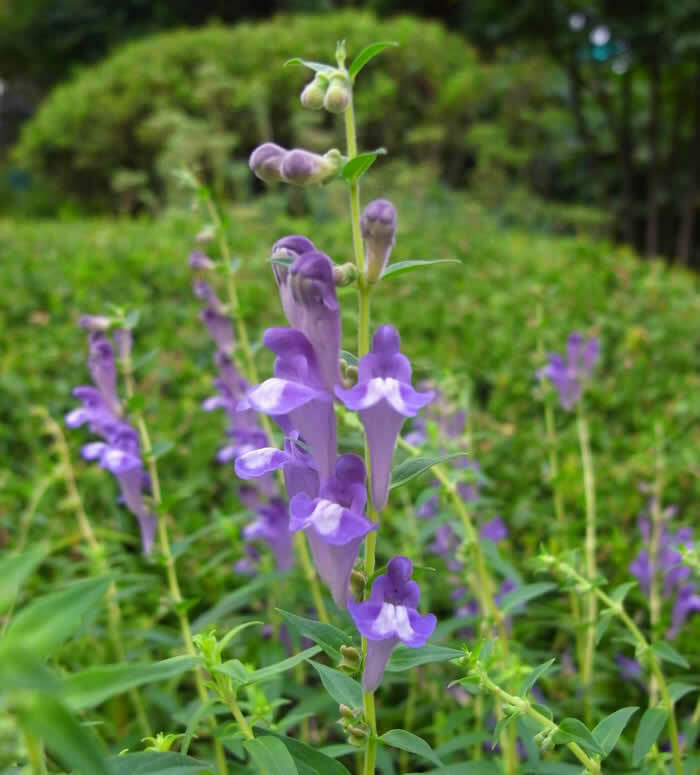 Another species used in Chinese medicine is Scutellaria barbata , whose Chinese name is banzhi lian. Skullcap was once called mad-dog weed because of its use during the eighteenth century to treat rabies. In addition, Native Americans used skullcap as a sedative, tranquilizer, and a digestive aid. Other cultures have used it as a sedative and to lower fevers. In contemporary practice, both common skullcap and Chinese skullcap are used as remedies for anxiety, nervous tension, premenstrual syndrome (PMS), insomnia, stress headaches, muscle spasms, seizures, and epilepsy. In addition, each herb is used for a variety of other conditions, and even in these conditions they are used differently. Skullcap (Scutellaria lateriflora) is currently known best as a herbal sedative. By reducing tension, skullcap may contribute to lower blood pressure. Skullcap is also used as a remedy for exhaustion, convulsions, menstrual cramps, and as a treatment for withdrawal from alcohol and tobacco. The herb may be taken as a bitter tonic to boost digestion. Skullcap is also sometimes used as a remedy for hiccups, hangovers, and asthma. In traditional Chinese medicine, baical skullcap (Scutellaria baicalensis) is prescribed for irritability, dysentery, diarrhea, infections accompanied by fever, hay fever, urinary tract infections, gout, jaundice,potential miscarriages, nosebleed, abdominal pain, and redness in the eyes or face. 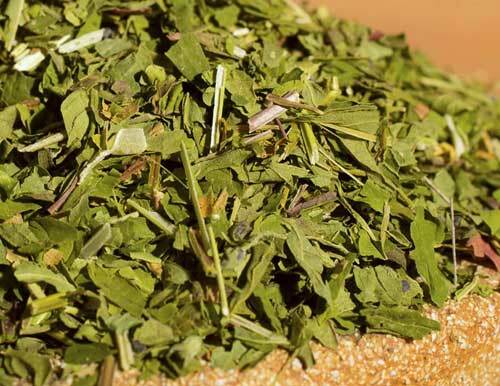 The herb is used for hepatitis and has been said to improve liver function. The root of baical skullcap is also given in formulas together with other herbs for vaginal bleeding, blood in the stool, and coughing or vomiting blood. Chinese skullcap is frequently among the ingredients in herbal compounds used for disorders involving high cholesterol and triglycerides levels, high blood pressure, allergic diseases, and inflammatory skin conditions. As of the late 1990s, research in countries including China indicated that Chinese skullcap showed “promise” in treating allergies, cancer, and as an aspirin-like anti-inflammatory remedy. Research at that time also indicated that the herb might be used in the future to prevent strokes and heart disease. A team of researchers in Hong Kong reported in 2002 that baicalein, a flavonoid derived from skullcap, appears to have chemoprotective effects against cancer. Another recent discovery is that a group of flavones in skullcap appear to protect nerve cells against the damage caused by oxidation. This finding may have potential applications in treating Alzheimer’s disease. Skullcap (scutellaria lateriflora) and Chinese skullcap (scutellaria baicalensis) are both taken internally. Skullcap is generally sold commercially as a liquid extract, as a tea, in dried form, and in capsules. The leaves and flowers are used as remedies for such conditions as insomnia. 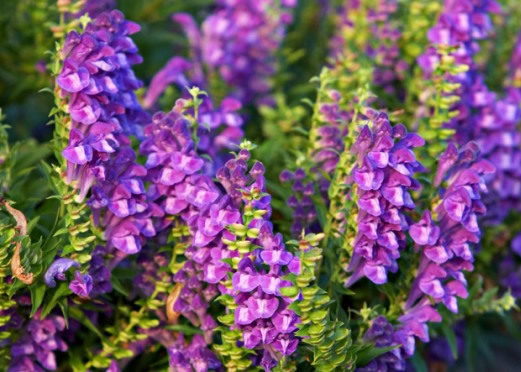 In the United States, “blue skullcap” refers to scutellaria that is frequently harvested without determining the species, according to Tyler’s Honest Herbal. Tyler, a respected pharmacognosist, wrote that “pink scullcap” is an adulterant with pink flowers. It costs the manufacturer less than blue skullcap. Chinese skullcap root is sold usually in bulk or capsule form, the capsules usually containing other herbs. Both Chinese skullcap and common skullcap have a bitter taste, and there are customary dosages for both herbs. A tea prepared by pouring 1 cup (250 ml) of boiling water over 1–2 tsp. (5–10 g) of dried leaves. The mixture is covered and steeped for 10–15 minutes. From two to three cups of tea may be consumed daily. A liquid tincture that can be taken three times daily. The tincture, 1/2–1 tsp (2–4 ml) of solution, is added to an 8 oz (250 ml) glass of warm water. Skullcap tincture can be purchased over the counter, or made at home by mixing the herb with water or alcohol in a ratio of 1:5 or 1:10. To ease insomnia, skullcap leaves can be placed inside a dream pillow. Also known as a sleep pillow, it can be made by sewing together two 8-in (20.3-cm) pieces of fabric. The dream pillow is placed under the bed pillow. Chinese skullcap tea is prepared by adding 1–3 tsp (5–15 g) of the powdered root to 1 cup (250 ml) of boiling water. The mixture is covered and steeped for 10–20 minutes. From three to four cups may be consumed daily. Baikal skullcap is also available in capsule form. Three capsules of the standard dosage may be taken for treatment of liver ailments and chronic inflammatory conditions. The root of Chinese skullcap is usually decocted, but it may be fried dry and consumed for conditions such as diarrhea and urinary tract infections. The root can be cooked in wine to treat upper respiratory infections and redness in the face and eyes. A practitioner of traditional Chinese medicine can provide information about specific dosages. Skullcap may be combined with other herbs such as oats or St. John’s wort. It works well in combination with such sedative herbs as valerian, passionflower, and black cohosh. Skullcap is included among the herbal ingredients in a tincture that people take to quit smoking. Other herbs in this tincture include mullein, St. John’s wort, and licorice. Before beginning herbal treatment, people should consult a physician, practitioner of TCM, or herbalist. This precaution is especially important when taking skullcap or Chinese skullcap because there is disagreement among health care professionals about whether these herbs are safe to use. Advocates of both remedies state that research conducted in China and Russia proves that skullcap is safe and effective. Although the United States Food and Drug Administration does not subject herbal preparations (which are regarded as dietary supplements) to the same types of regulatory procedures as prescription drugs, it does monitor reports of adverse interactions to herbal products. Between 1996, when the FDA’s MedWatch program began, and January 2003, there have been no reports or alerts for American consumers regarding products containing skullcap. There have, however, been reports of liver toxicity from products containing skullcap in the Netherlands and Norway in the early 1990s. Until more is known, some experts advise that skullcap should be avoided on the grounds that it can cause liver damage. That is also the position of Hepatitis Foundation International, which rates skullcap as toxic to the liver. That position that had not changed by May of 2000. It is also possible, however, that skullcap may have been mistakenly identified as dangerous. Tyler was among the herbal experts who pointed out that germander, a herb that causes liver damage, was found in the skullcap products taken by people who experienced liver damage. In addition, some supporters of skullcap maintain that prejudice against the herb stems from its previous use as a rabies treatment. Skullcap is safe for adults when taken in proper dosages. Skullcap advocates state that the herb can be used safely for relieving conditions such as PMS. Some experts, however, recommend medical supervision when taking skullcap for medicinal purposes. That precaution is particularly important for pregnant women and those who are lactating. Skullcap may cause drowsiness, so the person taking it should not drive or operate heavy equipment. Chinese skullcap should not be taken when a person has diarrhea or a deficiency of heat in the lungs. Possible side effects include diarrhea, an upset stomach, and drowsiness. If the first two conditions occur, the person should reduce the dosage of skullcap or stop taking it. In addition, large amounts of the tincture may cause giddiness, twitching, confusion, erratic pulse, and seizures. In traditional Chinese medicine, Chinese skullcap is said to offset the effects of some Chinese remedies. For this reason, it is important that persons using Chinese skullcap consult a traditional practitioner, as Chinese skullcap is usually given in combinations of herbs that are specific to each symptom. With regard to standard prescription medications, people who are taking antihistamines, barbiturates, benzodiazepines, or sedative medications should not use skullcap because it will intensify their effects on the central nervous system, particularly drowsiness. People who are taking skullcap should discontinue its use two weeks before any surgical procedure requiring general anesthesia, as skullcap interacts with anesthetics to lower blood pressure. For the same reason, skullcap should not be used by persons who are taking drugs to control high blood pressure (antihypertensives). Skullcap also interferes with the body’s absorption of iron and other minerals; persons who are taking mineral supplements should therefore use skullcap with caution.